There’s no doubt that teaching can be stressful & overwhelming at times. But that certainly doesn’t mean it should be taking over your life. If you’re spending way too much time being a teacher and not enough time being a parent, spouse, friend, or church member, something needs to change. You CAN be an effective teacher and still have a life outside of school. But it certainly won’t happen by accident. To create the balance you so desperately need, you’ve got to make some changes. And these 6 time-saving principles are the key to getting your life back. These principles come from Angela Watson, creator of 40 Hour Teacher Workweek Club, an amazing club that’s changing hundreds of teachers lives. These over-arching principles form the foundation of the club & can be applied to all areas of teaching – and life. Eliminate unintentional breaks. Notice the goal is not to eliminate all breaks. The point is to work when we plan to work and break when we plan to break. During work times, we can’t allow ourselves to be distracted by social media, our phones, our own procrastination, or anything else. Figure out the main thing & do it first. This concept has transformed my productivity, and I know it can do wonders for yours, too. Each day, think about what one important task most needs to be done that day. Then during the first block of time you get, do that main thing first. Don’t check your email or throw some grades in the computer first. Instead, get the main thing done first then worry about everything else. You’ll feel great knowing that even if the rest of the day gets derailed, at least you got your most important task done. Work ahead by batching & avoid multi-tasking unless the work is mindless. Batching means doing the same task all together instead of doing the same thing over and over. For example, if you make all your copies for the whole week at once, that saves time over running to the copier 5 times a day. It takes intentional planning to work ahead by batching, but it feels so good once it’s done. Now when it comes to multi-tasking, I am a chronic multi-tasker. But I’m learning that multi-tasking only helps when the work is truly mindless (think checking multiple choice answers or making copies). Otherwise, multi-tasking actually breaks your focus & makes you less efficient. Look for innovative ways to relax any standards that create unnecessary work. Sometimes we as teachers have these standards for ourselves that we simply made up. We’ve decided in our minds that this is the way it has to be done, even though it’s taking up a ton of time. But the reality is that we don’t have to do it that way. There’s probably another way to do it that will work just as well in a whole less time. The key to letting our unnecessary standards go is to realize that when we say “yes” to one thing, we’re actually saying “no” to something else that might be even more important. So ask yourself if your own standards are really worth the time or if there’s an innovative way to relax this unnecessary standard. Use scheduling to create boundaries around your time. If you don’t decide ahead of time when you’re going to work & when you’re not, work will always spill over into your family life. But if you instead plan when you’re going to work & schedule that time, you create boundaries around your time and you’re able to actually walk away. 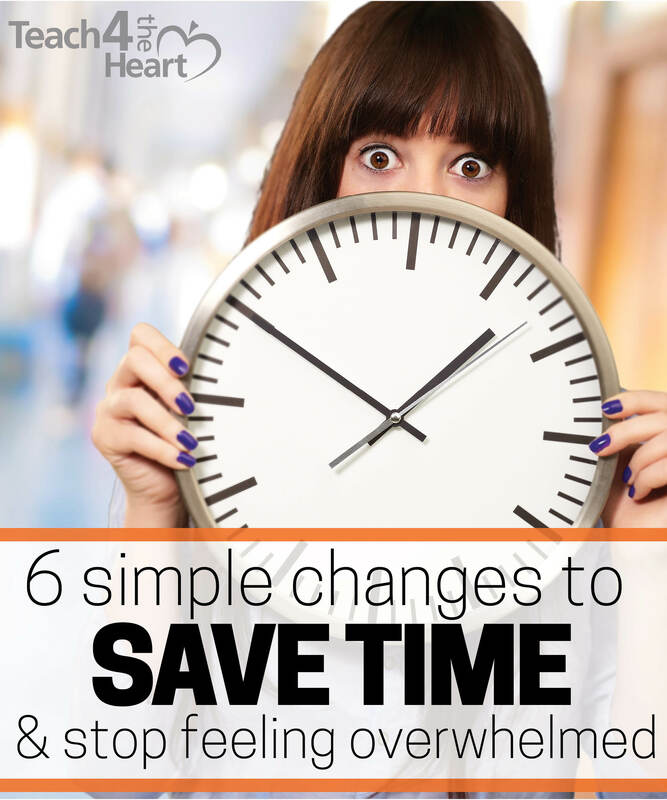 Angela Watson has offered Teach 4 the Heart readers an awesome resource to help you decide how many hours you need to work to get done what you need to, schedule that time, and then stick to it. Click here to get your free guide “How to Choose a Target Number of Work Hours & Stick to It”. Always be looking for small ways to save time. They add up. Don’t ever discount ways to save 5 minutes here or 10 minutes there. Over time these little changes add up to big results & give you the space & freedom that you so desperately need. 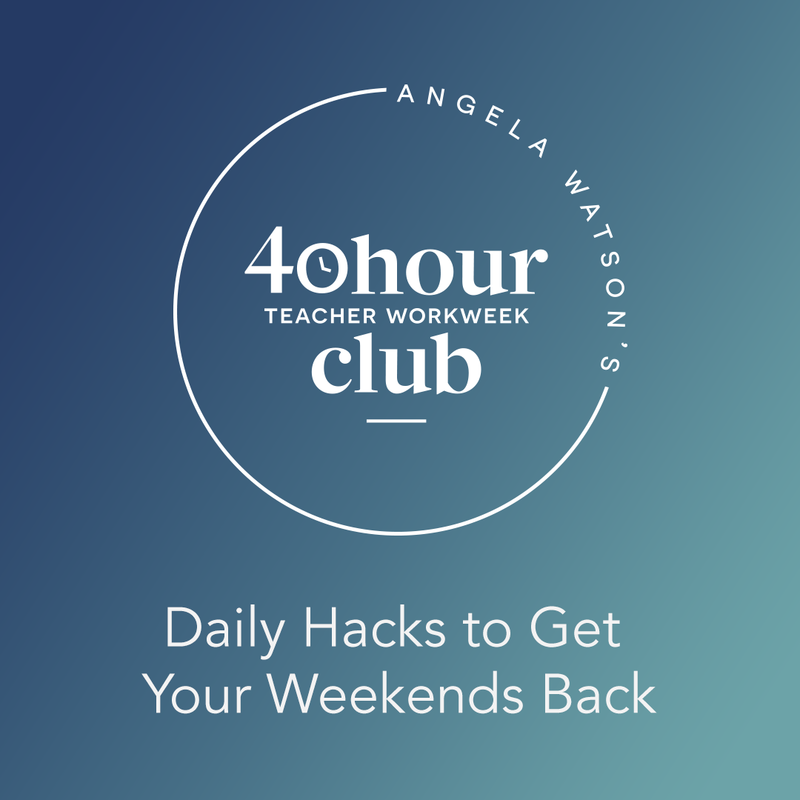 If you’re tired of feeling overwhelmed and exhausted and know something has to change, then you owe it to yourself & your students to check out the 40 Hour Teacher Workweek Club. This incredible program is helping thousands of teachers just like you not only cut 3, 5, even 10 or more hours off their workweek but actually break that 24/7 stress cycle and finally enjoy teaching again. The 40 Hour Teacher Workweek will teach you how to live a better, healthier life as a teacher – how to get everything done and still have room for yourself and your family. And, best of all, you’ll find yourself become a better, more organized, and more efficient teacher in the process. I cannot recommend this program highly enough. Click here to find out more about the 40 Hour Teacher Workweek Club. Which principle most resonates with you? Share your thoughts with a comment below. And don’t forget your free guide from Angela Watson. Click here to get your free guide “How to Choose a Target Number of Work Hours & Stick to It”. Help out a fellow teacher by sharing this post on Pinterest or Facebook. *Disclaimer: I am partnering with Angela Watson to help spread the word about this amazing program. If you enroll in the club after clicking the button above, I will receive a percentage of your enrollment fee at no cost to you. If for any reason this makes you uncomfortable, you can simply google “40 Hour Teacher Workweek.” Please know I am only recommending this program because I think it’s amazing and believe it will be a great help to many of you. These are so simple, and yet so true. I’m printing these and the Eight Lies Teachers Tell Themselves to keep track of these God-honoring truths.